You’re almost done kegging your beer and have just transferred your beer from fermentor to clean kegs. Before you get to this step, you should have had your filters soaking in bleach solution for the prior week. If you were careful and did not pick up any yeast during the transfer, you should only need one pair of filters: 5 micron pleated coarse filter and a 1 micron fine filter. Soaking filters in bleach water ready for use. *Definitely get reusable filters and clean by back-flushing from prior use and soaking in bleach for a week (yes, it will take that long especially with more yeast). I have used my filters for 1 year so far. **The colder your fermented beer is, the more clear you will filter and the less stuff will ‘drop out’ when you put it on tap. Step 1 – Install filters and flush with water. Note, coarse filter is first and fine filter is last. Flushing will be with filtered water (that very left, white canister) and will last 5-10 minutes. Taste the water so that there is no chlorine taste left. 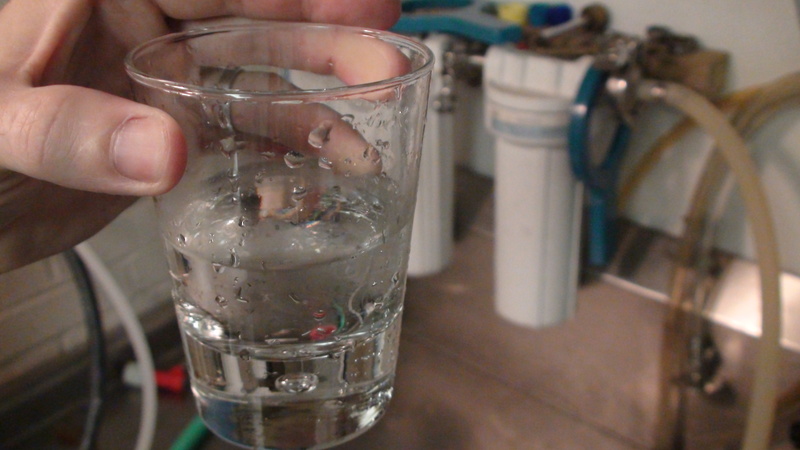 Step 2 – Unscrew and remove filters, pouring off water, install filters again (water will dilute the beer coming out). 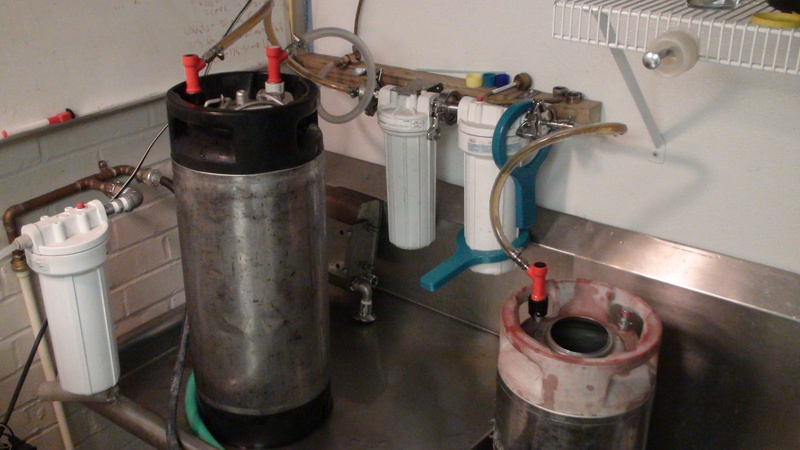 Hook up sanitized liquid lines: one going from full keg to filter, the second from the filter to a sanitized, empty keg. Attach CO2 line. 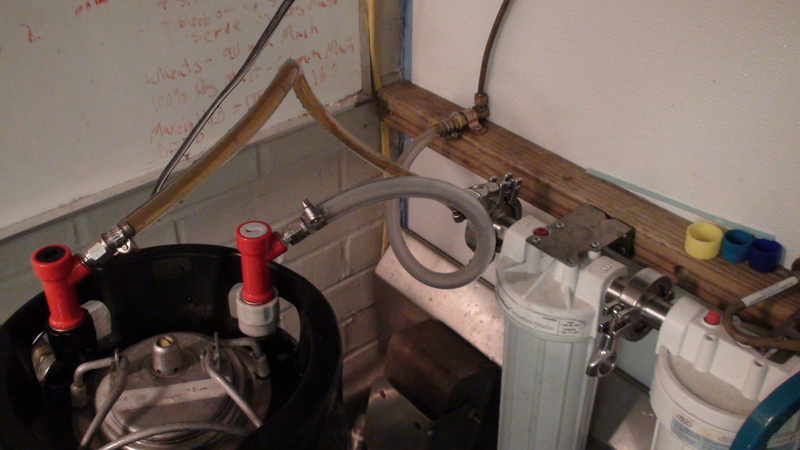 Step 3 – Turn on CO2 to push beer through filter. You will only need 2-4 lbs at the beginning – just a slow flow, no hurry. Step 4 – You will have to collect about a 1/4 gallon of beer to discard as it will be the first ‘watery’ run-off. Reconnect and start final collection. 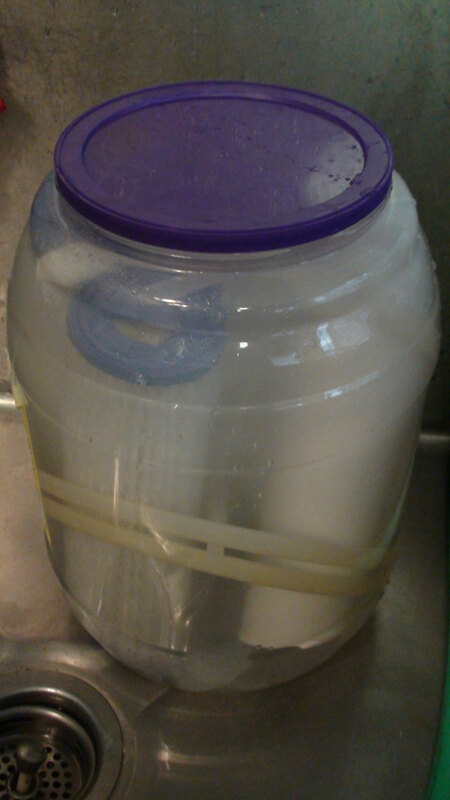 Filtering will take about 1 hour per 10 gallons. It will be slower if you collected yeast sediment. 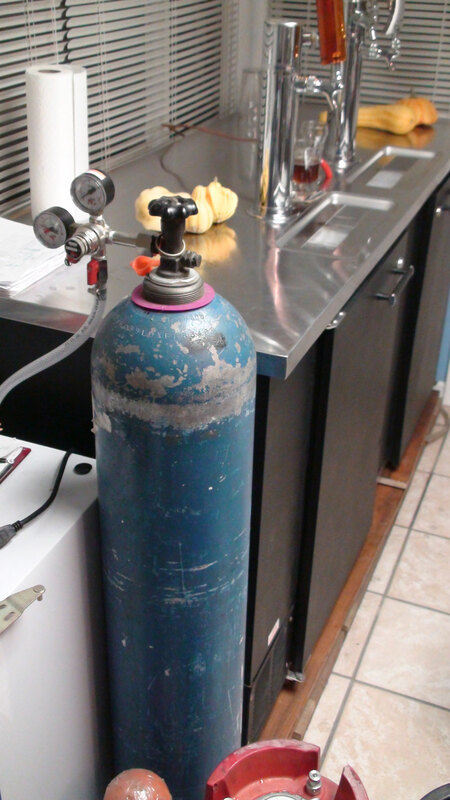 You may have to increase your CO2 pressure periodically to keep it flowing. I have gotten up to 40lbs before – that’s when I know I wasn’t careful enough and picked up a lot of yeast sediment. If you did everything right, you shouldn’t have to go over 10-15 lbs of pressure. THINGS I HAVE LEARNED TO MAKE THIS UBER EASY. Start with the keg that collected the first 5 gallons of beer from the fermentor as it will be devoid of most yeast and make it easier and quicker to filter overall. On the first keg, DO NOT let it run dry as it will create a bubbling, foamy mess and it may make filtering the 2nd keg harder. Essentially DO NOT WALK AWAY. Yes, I use CO2 to push the beer. 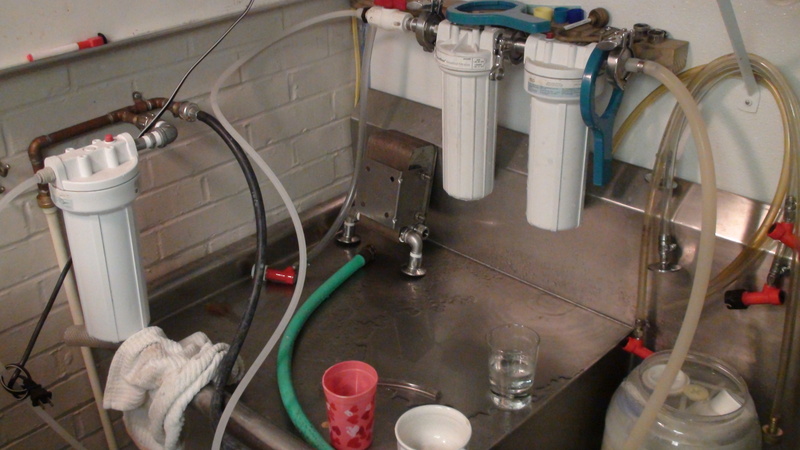 I first used the beer pump to push the beer when I started filtering. It was VERY ineffective and VERY slow. Don’t use a pump to filter. Use only CO2. You should only have to use one pair of 5/1 micron filters per 10-15 gallons. Though having an extra pair ready will be useful in case you get stuck. When done filtering, backflush filters for about 5 minutes before putting in bleach water.